From Left to Right: Mr. Shahid Malik, former High Commissioner to India; Dr. Parvez Hasan, Senior Advocate Supreme Court; Lt Gen (Retd) Moinuddin Haider, former Federal Minister of Interior; Mr. Muhammad Sadiq, former Secretary National Security Division; Mr. Ahmed Bilal Mehboob, President PILDAT; Mr. Saleem Safi, Senior Anchor/Journalist; Mr. Shahid Hamid, former Federal Minister for Defence ; Mr. Mujib-ur-Rehman Shami, Senior Analyst; Mr. Muhammad Shoaib Suddle, Former IG. 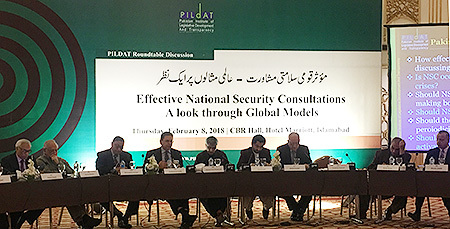 February 08; The PILDAT Roundtable on Effective National Security Consultations – A look through Global Models concluded with the consensus demand that the NSC must meet weekly, or atleast on a monthly basis and must be made more effective. 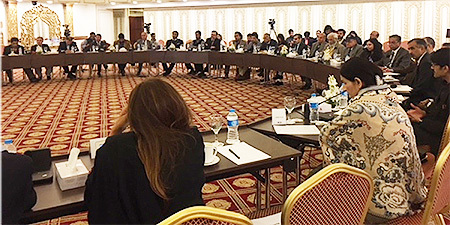 Speakers at the Roundtable included Mr. Muhammad Saddiq, former Secretary National Security Division and Mr. Saleem Safi, Senior Analyst, who were joined by members of PILDAT Dialogue Group on Civil-Military Relations includingLt. Gen. (Retd.) Mr. Humayun Bangash, Former Ambassador;Lt. Gen. (Retd.) Moinuddin Haider, Former Governor Sindh; Dr. Parvez Hassan, Senior Advocate, Supreme Court of Pakistan; Mr. Shahid Hamid, former Federal Minister for Defence; Mr. Shahid Malik, Former High Commissioner; Lt Gen (Retd) Talat Masood, Former Defence Secretary/Political Analyst; Mr. Arif Nizami, Senior Analyst and Mr. Mujib-ur-Rehman Shami, Senior Analyst. The Roundtable was joined by a number of eminent personalities including Dr. Muhammad Shoaib Suddle, Former IG; Mr. Diyar Khan, Joint Secretary National Security Division; Mr. Ayaz Wazir, Former Ambassador, Mr. Iftikhar ullah Babar, Former Secretary Senate, Mr. Tahir Khalil, Bureau Chief-Islamabad-Daily Jang, Mr. Muhammad Ziauddin, Senior Analyst/Columnist; Ms. Emma Leahey, First Secretary (Political), Australian High Commission, Ms. Sabiha Nazir, MNA-PML-N, Ms. Aisha Sayed, MNA-JI, as well as other members of civil society and a large number of media personnel from the print and electronic media. Mr. Saleem Safi, Senior Journalist, said that pre-eminence of military in Pakistan’s national security policies has meant that civilian supremacy, as defined under the Constitution, has only become a dream. While Pakistan Military leads through its unparalleled discipline, the civilian elected leadership, through its inability to provide good governance, have ceded space to Military on national security and regional and foreign policies. Political leaders and parties have not prepared themselves on dealing with central issues of foreign policy, internal security and national defence. Issues and problems of FATA and Balochistan are not discussed. This Government and previous Governments have shied away from holding institutional dialogue and instead relied on individual meetings between elected Prime Minister and Services Chiefs. National Security consultations and dialogues must now include key political leaders and other stakeholders. However commendable the model of NSC, it is failing to provide the forum that requires to address key concerns. Mr. Muhammad Sadiq, Former Secretary National Security Division, said that evolution of Cabinet Committee of National Security or NSC was created through a political consensus. Earlier, the Services Chiefs were invited to join meetings and will not be full members. However, the new COAS at the time, Gen. Raheel Sharif, asked for Services Chiefs to be full members. That led to the change of nomenclature of the Committee from a Cabinet Committee to the National Security Committee. That it should be a decision-making body was agreed within the Committee that allowed Premier to bypass the Cabinet and the Parliament. The change to decision-making body from the originally-planned advisory body, affected the Committee’s effectiveness as both the COAS and Premier began to meet individually and avoided regular meetings of the Committee. Once the spat between the Premier and the Interior Minister resulted in the meeting not being held for 5 months. Mr. Khan shared that one of the members proposed that monthly meeting of the NSC is too soon and proposed that the meeting should be held every three months to which Prime Minister Nawaz Sharif at the time quipped that since Pakistan does not have many national security issues, monthly meetings are indeed too much. After a while the Committee could not even hold meetings every three months. While the NSC worked a great deal during the first year on policy issues on Afghanistan, the momentum was lost afterwards. Similarly the initiative on FATA reforms by the NSC did not at that time received the support by the Military and therefore, despite proposals, the reforms could not be constituted. Looking forward, Mr. Muhammad Sadiq said that it is imperative that the NSC must meet more frequently and preferably on a weekly basis. The office of the National Security Advisor must be occupied by an individual who has priority access to both the Premier and the COAS. Sharing his views at the occasion, Dr. Parvez Hassan, Senior Advocate Supreme Court, said that the NSC must have a law defining its membership. The law must make it compulsory that decisions should only be made by holding physical meeting and bar against decision making through circulation of policy decisions. He also proposed that the NSC membership should be enlarged to include other stakeholders such as Presiding Officers of the Parliament. The tiers of NSC must be activated and involve think tanks and experts who provide policy input to the NSC. Dr. Hassan also advised that the NSC must publish an Annual Report that details the meetings held and issues discussed without divulging details of discussions. Mr. Shahid Hamid , former Federal Minister for Defence, recommended that meetings of NSC must be held weekly ahead of the meetings of the Federal Cabinet and consultations or decisions of the NSC must be endorsed by the Federal Cabinet. This is especially necessary in the light of recent ruling of the Supreme Court that it’s the Federal Cabinet and not just the elected Prime Minister, who is constitutionally responsible for executive decision-making in the country. Mr. Hamid was of the opinion that the NSC does not need to be supported by a new legislation and like the Council for Defence and National Security (CDNS) established by the Caretaker Government in 1997, it is correctly established under the Ruled of Business. He also believed that there is no need of any change to the composition of the NSC. He also laid stress on the need to formulate a National Security Policy on priority. Other Members of the PILDAT Dialogue Group on Civil-Military Relations, including Lt. Gen. (Retd.) Moinuddin Haider, former Federal Minister of Interior, and Mr. Mujib-ur-Rehman Shami, Senior Analyst, supported weekly meetings of NSC but discouraged that other political parties or office bearers be included in the NSC. Mr. Shami said that statutory role of NSC will weaken the authority of the Federal Government which must be avoided. The NSC must be an advisory body and decisions should be taken by the Federal Cabinet. Lt. Gen. (Retd.) Humayon Bangash said that the role of the Secretariat of the NSC is of paramount importance in its effective functioning. Mr. Arif Nizami, Senior Analyst, said that the dormancy of NSC under the premiership of Mr. Nawaz Sharif was due to his personal distaste for institutional structures curtailing his own powers. The NSC will have to be evolved overtime to be effective. Mr. Shahid Malik, former Ambassador, said that the NSC must meet regularly. Earlier, Mr. Ahmed Bilal Mehboob, President PILDAT, while introducing the subject of the Roundtable, said that Consultations on national defence and security with key organs of a State, ahead of the Executive making policies, are a globally accepted practice. The need for consultations becomes evermore critical in Pakistan as a country that has been ruled by Military for a number of years since independence and as a consequence, continues to witness estranged and strained civil-military relations. Over the years, Pakistan has experimented with setting up organs for such a consultation evolved through Defence Committees of the Cabinet, National Security Council and since 2013, a structured National Security Committee (NSC) with a Secretariat. The Roundtable discussed comparative global examples on effective functioning of NSCs and posed questions on effectiveness of Pakistan’s NSC in discussing long-term strategic issues and its evolution.